Located in the far southeastern part of the United States, Georgia is a magnificent state—a state that offers a number of different terrains and climates that collectively makes it a perfect spot for outdoor camping and recreation. Named after King George II of Great Britain, Georgia was established in 1733 and was the last of the original Thirteen Colonies. Today Georgia is the 24th-largest country in the union by total area and the 8th-most populous, making it fairly dense in terms of population. Atlanta is the state’s capital, its most populous city, and is a named global city, also called world city or sometimes alpha city or world center, a city generally considered to be an important player in the global economic system. Georgia is bordered to the south by Florida, to the east by the Atlantic Ocean and South Carolina, to the west by Alabama, and to the north by Tennessee and North Carolina. The state’s northern part is situated in the majestic Blue Ridge Mountains, part of the Appalachian Mountains system which offers many great places to camp, fish and hike. The Piedmont region of the state extends through its central part, ranging from the foothills of the Blue Ridge to the Fall Line, where the rivers cascade down in elevation to the coastal plain of the state’s southern part. Georgia’s highest point is Brasstown Bald at 4,784 feet (1,458 m) above sea level; the lowest is the Atlantic Ocean off its coast. Georgia is the largest state east of the Mississippi River in total land area. Each region of Georgia has its own distinctive characteristics, all of which are attractive to campers and outdoor enthusiasts. For instance, the Ridge and Valley, which lies in the northwest corner of the state, includes limestone, sandstone, shale and other sedimentary rocks, which have yielded construction-grade limestone, barite, ocher, and small amounts of coal. The state has approximately 250 tree species and 58 protected plants. Georgia’s native trees include red cedar, a variety of pines, oaks, hollies, cypress, sweetgum, scaly-bark and white hickories and sabal palmetto. Campers in Georgia will regularly see White-tailed (Virginia) deer, found in nearly all counties, and the northern mockingbird and brown thrasher are among the 160 bird species that live in the state. In the following article we will highlight five of Georgia’s most popular and well-visited camping spots, and provide a brief description of the activities and amenities that make each of these wonderful locales so well-loved among campers and nature lovers. Located in the small town of Rising Fawn, Georgia, Cloud Canyon State Park is one of the most breathtaking spots in the state, offering many places in which to camp, explore and discover. Cloud Canyon State Park is situated on the western edge of Georgia’s Lookout Mountain, an extremely scenic piece of earth that offers rugged and challenging terrain, as well as gorgeous vistas as far as the eye can see. The park straddles a deep gorge cut into the mountain by Sitton Gulch Creek, and its elevation ranges from 800 feet to almost 2,000 feet above sea level. The most spectacular view to be found in Cloud Canyon State Park can be achieved very near the picnic area parking lot; however additional views, each of which are very photo-worthy, can be found along the rim trail. The collective trails at the park are inviting to hardy campers and visitors, who can make their way to the bottom of the gorge and the refreshing spray of two seemingly, intertwined waterfalls cascading over layers of sandstone and shale into sparkling pools below. Cottages are located near the canyon edge, while the park’s walk-in campsites provide privacy and seclusion for tent campers. All of the campsites at Cloud Canyon State Park offer a number of great amenities, including picnic tables and covered shelters; BBQ grills and fire rings; trash receptacles; restrooms; showers and more. The most popular activity at Cloud Canyon State Park is enjoying the scenery, but guests can also take part in a number of family-friendly, theme-oriented activities sponsored by the park staff. The tent camping sites at Cloud Canyon State Park are available to rent on a first-come, first-served basis. However, the RV sites (which come with water and electrical hookups) and the cottages must be reserved in advance due to their popularity and limited number. Those planning to stay in the park’s cottages must bring their own linens and towels, while dishes and cooking and eating utensils are provided at no extra cost. Situated in the rural town of Blairsville, Georgia, Vogel State Park is a great place to camp for both adults and children alike—a place that offers fun, adventure and plenty of secluded relaxation. Considered one of Georgia’s oldest and most popular state parks, Vogel State Park is located at the base of Blood Mountain in the state’s Chattahoochee National Forest. Visitors driving from north to south will eventually pass through Nell Gap, a breathtakingly beautiful mountain pass located very near Brasstown Bald, the highest point in the entire state of Georgia. Vogel State Park is especially popular during the autumn months—a time when the trees in the adjacent Blue Ridge Mountains are transformed from green into a rolling oasis of red, yellow and gold leaves. The trails at Vogel State Park are legendary. Hikers can choose from a variety of popular routes, including the well-traveled, four-mile Bear Hair Gap Loop, a relatively easy lakeside loop that takes explorers toTrahlyta Falls; and the challenging 13-mile Coasa Backcountry Trail. Campsites, cottages and primitive backpacking regions at Vogel State Park provide a full range of overnight accommodations for guests. The park’s massive 22-acre lake is open to non-motorized boats only; and during the summer months campers and day visitors can cool off and catch some rays in the waters off Mountain View Beach. Vogel State Park is rich in history, and many of the campground’s facilities and shelters were built during the Great Depression Era by the Civilian Conservation Corps (CCC). All accommodations at the park are available on a first-come, first-served basis, and the most coveted spots, which are located near the shores of the lake, tend to rent very quickly during the summer months. Those looking to camp in a peaceful and serene setting will fully enjoy a night or two (or three) under the Spanish moss at Skidaway Island State Park. Located in the grand town of Savannah, Georgia, this gem of an outdoor facility is tucked neatly into the Georgia marshes, offering a sense of security and seclusion that is often hard to come by. Situated in one of the most historic parts of Georgia, this gorgeous camping park borders the Skidaway Narrows, a portion of Georgia’s great intercoastal waterway. Some of the most prominent aspects of this oasis are the scenic trails, which wind through the maritime forest, past salt marsh, on their way to a beautiful boardwalk and observation tower. Campers and day visitors will often see a variety of wildlife as they make their way through the park, including deer, raccoons, egrets and the plentiful fiddler crabs. Within the park’s Interpretive Center, bird lovers (and watchers) will find binoculars, reference books and a large picture window where they can be on the lookout for migrating species of avian life. Children will especially adore the tall, majestic replica of a Giant Ground Sloth in the reptile room—a lifelike statue that reaches 20 feet at its apex. 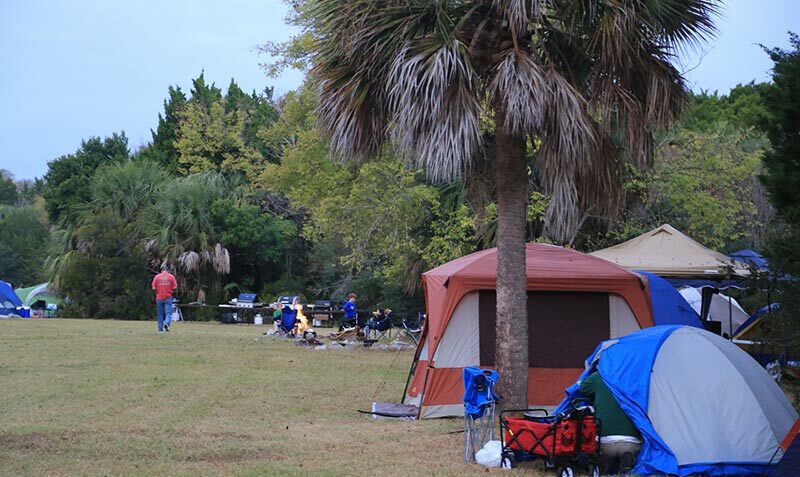 The pristine campground within Skidaway Island State Park rises amid the live oak and Spanish moss. Tent sites and RV campgrounds are available to rent, the latter of which offer hookups for water and electricity as well as sewage. Groups can enjoy coveted privacy in their very own pioneer campgrounds, where they can “rough it” without giving up too many of the modern conveniences. The open-air picnic shelters and an enclosed group shelter at Skidaway Island State Park are popular spots for parties, reunions and other celebrations; and for just cooling off during the summer, you just can’t beat the Tybee Island beaches, which are less than an hour away. Skidaway Island State Park’s camper cabins offer screened porches, air conditioning, bathrooms with hot-water showers, kitchens, master bedrooms and a child’s sleeping loft. Guests of the cabins must bring their own linens, towels, dishes and cooking utensils. The Toccoa Valley Campground, situated in the town of Blue Ridge, Georgia, is a majestic outdoor facility, one that offers activities for every member of your group and/or family. Offering scores of RV sites with electrical and water hookups, and many more primitive tent camping stations, the campground is one of the most popular and well-visited outdoor recreation sites in the entire state. The Toccoa Valley Campground offers many great amenities that campers celebrate. Among these are full-service restrooms—with showers and pit toilets—a dump station and dozens of well-placed trash receptacles; BBQ grills for outdoor cooking; picnic tables and a few covered picnic shelters; fire rings for nighttime and morning campfires; and a well-stocked camp store offering items such as groceries, ice, charcoal, lighter fluid, sodas, beer, bait and fishing tackle. Collectively, these great amenities allow campers to take full advantage of their outdoor adventure while still enjoying some of the comforts of home. Activities are also plentiful at the Toccoa Valley Campground. The large lake affords great opportunities for fishing and boating, and there are certain parts of the lake where swimming is permitted during certain hours—hours in which a fully-trained lifeguard is always in duty. Many of the area’s splendid trails originate at the campground. Here you will find well-marked dirt routes that are ideal for hiking, backpacking and nature walking, all while taking in some of the most breathtaking scenery the state of Georgia has to offer. In addition to the many activities offered at the lake and on the trails, the Toccoa Valley Campground sponsors a number of family-friendly activities and events, such as a weekly ice cream social; a bonfire; and Olympic-style events that pit family against family in a number of fun and good-natured games. All of the campsites at the Toccoa Valley Campground are available on a first-come, first-served basis; and the facility also takes reservations for large groups up to one year in advance. Located in the quaint town of Brunswick, Georgia, along the banks of the mighty Altamaha River, Altamaha State Park is one of the most cherished locales among local campers and a place that consistently draws outdoor enthusiasts from across the southeastern United States. The beautiful campground at this Georgia state park is tucked away under a large canopy of trees (perfect for your hammock! ), offering peace, seclusion and plenty of relaxation to all who visit here. Altamaha State Park is loaded with great amenities—aspects that all outdoor recreationalists adore. The Altamaha River is just a short hike from the camping area, providing campers and visitors with an ideal locale in which to fish, swim and cool off from the hot summer heat. The many trails here, all of which originate just steps from the primary camping area, are perfect for those who enjoy hiking, backpacking, bird watching and simply admiring the local flora and fauna that makes Georgia such a beautiful place to visit. Other amenities include bathrooms with flush toilets and hot-water showers; BBQ grills under a covered picnic area; a fire ring for campfires, cooking and gathering; individual trash bins and a central dump station; playground facilities for the kids; and a well-stocked camp store that offers a variety of goods: ice, charcoal, groceries, fishing bait, tackle, ice-cold sodas, beer, T-shirts and other souvenirs. Altamaha State Park features RV sites with electrical and water hookups, as well as some more primitive tent camping sites that are both beautiful and private. The sites are available on a first-come, first-served basis, but because of the campground’s popularity, it’s crucial you arrive early on the weekends to secure your spot. During the summer months, the camp staff at Altamaha State Park sponsors a series of fun and family-friendly activities and events, including ice cream socials, birthday celebrations, movie nights, bonfires and more. Considered one of the best family campgrounds of its kind in the state, Altamaha State Park provides an outdoor adventure that you won’t soon forget.